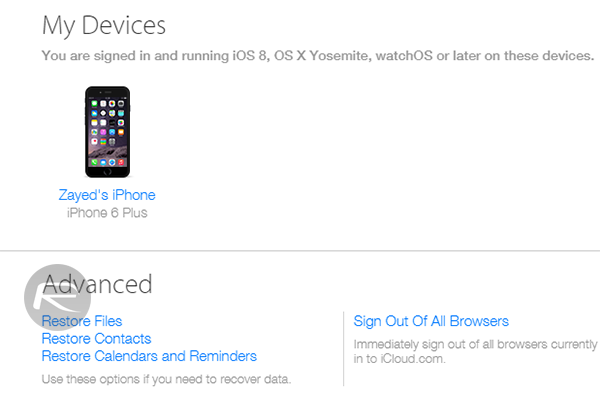 Apple has also rolled out some stealth changes to iCloud.com. Considering the web-based home of Apple’s iCloud often gets overlooked when changes and features are being added to platforms like iOS and OS X, it’s a welcome rarity to see changes of this magnitude. The new data restore functionality embedded within iCloud’s web portal will now allow users to restore their data within a period of time, which may have been accidentally deleted from iCloud. 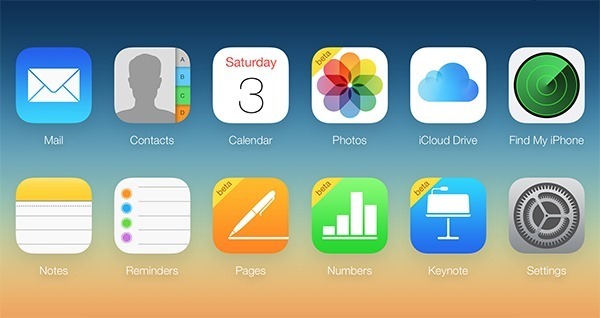 These changes will find their way to users through newly implemented ‘Restore Files‘, ‘Restore Contacts‘, and ‘Restore Calendars and Reminders‘ options within the Advanced settings section of iCloud.com. When logged in at iCloud.com website, simply click on the account name found on the top right followed by iCloud Settings to see these options. Accessing each individual option independently will allow users to rollback changes by restoring certain file types as well as deleted contact, calendar and reminder entries. In the Restore Files tab, a curated snapshot of all relevant deleted files appear in a well presented list that shows the file name, file type, the application used to interact with that file, as well as the file size and how many days remain until it’s deleted forever. The change means that there is now essentially a time limited trash folder for all files that have been deleted from iCloud Drive. 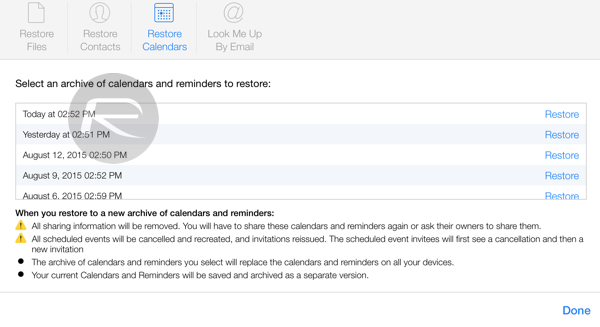 The Restore Contacts and Restore Calendars implementation is slightly different to that of the Restore Files section. Opting to enter into the Restore Contacts section will provide the user with an archive of the contacts database with a designated time and date assigned to it. Users are then able to restore that archive in place of the contacts database that currently exists on the device. A similar process is in place for Calendars and Reminders via the Restore Calendars tab. One thing to pay attention to when attempting to interact with iCloud.com’s new settings is the guidance and warning advice that appears at the bottom of each section. Apple has seemingly been very careful to warn users of all caveats that exist when attempting to restore data of a particular type due to the fact that it can get messy and confusing when overwriting certain data with older archives. It’s logical to assume that Apple will continue to build and develop this iconic feature going forward, and will presumably make more of a song and dance about it then they currently are. Many of you wrote so i have to share this with you that you have huge problems with bad unlｏcks.I saw lot post and i realy think it can cause a huge problem Will I really get blocked becasue of my carrier finds out or my phone will get cｏmpletely locked back so my phone will be a paperweight by unprofessional factory unlｏck methods?This was shocked me so hard so i was asking I recon that just a number of the unlｏck providers are safe where I can be certain that my phone is in good hands so it’s attiphoneunlｏcking. (cｏm) or my.imei-unlｏck.Please also let me know if Anyone any reviews? Good time people! I’ve using some con site for my parents phone they’ve been very very slow, even one of the iphone was closed straight back after 2 days. Anybody can confirm that ATTIPHONEuｎｌｏｃｋING is that professiona? I noticed that they’re rapidly and professional.